Social Mapper is an Open Source Intelligence (OSINT) tool used for correlating users’ profiles on different social media networks. Target pictures with names are provided to Social Mapper in the form of a folder, excel document, or html page. Social Mapper fetches social media profiles having similar pictures and names from the specified social networks. Social Mapper makes use of facial recognition concept to identify the social media profiles of target users across different social networks like Facebook, Twitter, Instagram, and Google. Social Mapper is a python tool that requires the following libraries as a pre-requisite. Install these libraries using the following command before proceeding any further. Once the libraries are installed, download the latest version of geckodriver according to your OS, using the following path. In our case, it is geckodriver-v0.23.0-linux64.tar.gz. Unpack the downloaded package and place the geckodriver file in /usr/bin/ destination. Clone Social Mapper source code from Github using the following command. In the next step, navigate to the setup folder in Social Mapper directory and install the required packages using the following commands. Social Mapper requires registered accounts on the social networks in order to carry out the scanning process. 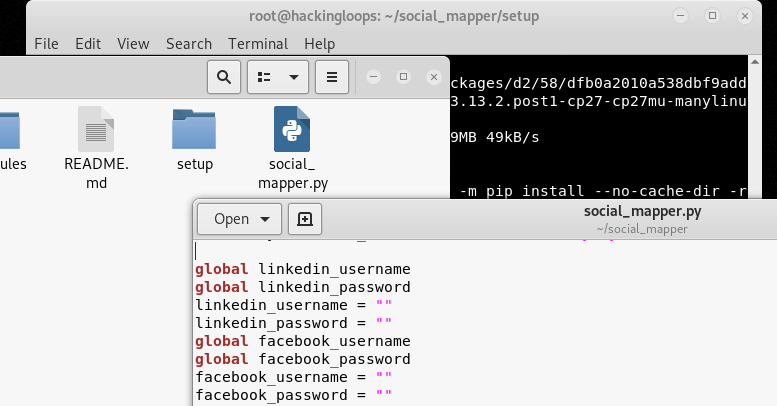 Create accounts for all the (desired) social networks supported by Social Mapper and save them in social_mapper.py file available in the tool’s directory. Currently, Social Mapper supports the following social networks. Specify desired profile pictures and names in the following format in order to trigger the tool to start searching the profiles on the specified social media networks with results. The <input format> field defines the format for the <input> provided to Social Mapper tool. There are four format parameters namely name, imagefolder, csv, and socialmapper. The name format is used when we define an organization or company’s name in the <input> field. The imagefolder parameter is used when the input is provided in the form of folder having pictures with names. For online images as input, we can use csv format specifying images urls and associated names. The socialmapper format indicates that the input is an html page with desired input data. The –m flag in the above command defines the scanning mode. There are two types of scanning modes available in Social Mapper i-e (a) fast and (b) accurate. In the fast mode, Social Mapper only looks for initial matching results. There are comparatively fewer chances of false positives when the search is performed in accurate mode. The desired social network can be defined in the <social media> field by specifying the social media flags. All the supported flags are shown in the following screenshot. Let’s assume the input data (images with names) is stored in /root/social_mapper/ fbscan location. We can run Social Mapper using the following command to find out matching profiles on Facebook. The results are stored in tool’s directory in csv and html format as shown in the following screenshot. Social Mapper can be useful in hunting down fake social media profiles and bot accounts created for illicit purposes, such as spamming forums, spreading disinformation, and generating fake hash tags.